MAUMEE, OH, March 30, 2016 – Aktion Associates announced today that CRN®, a brand of The Channel Company, has named Aktion Associates to its 2016 Tech Elite 250 list. This annual list honors an exclusive group of North American IT solution providers that have earned the highest number of advanced technical certifications from leading technology vendors. Aktion Associates is one of only ten Ohio companies named to this prestigious list. To compile the annual list, The Channel Company and CRN work together to identify the most customer-beneficial technical certifications in the North American IT channel. Companies who have obtained these elite designations— which enable solution providers to deliver premium products, services and customer support—are then selected from a pool of online applicants. “Our most valuable resource is talent, and we continue to attract and maintain the best available team. We also understand and appreciate the value of ongoing education, training and certification, for both our internal and external customers. As a result, our company culture enables us to attract and retain an empowered and highly trained and certified workforce,” said Scott Irwin, CEO of Aktion Associates. 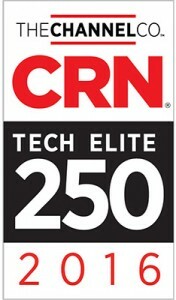 Coverage of the Tech Elite 250 will be featured in the April issue of CRN, and online at www.crn.com.